Wow the number of patients I have to talk to every day due to the electronic injuries! What are the characteristics of electronic injuries? Electronic injuries abound daily! If I had 25 cents every patient I speak to about changing the way in which they use phones, an IPad, IPhone, tablets, laptops and sit at their work station! Below are items you should think about when you go about your daily activities and make use of electronic equipment. I see a lot of repetitive strain issues (electronic injuries) as patients due not place themselves in a normal alignment when making use of these devices. If you follow the advice I set out in the newsletter you will be better able to make use of your body properly and not fall into the same patterns as many other people do! Feel free to read on……. Nearly a decade after the smartphone’s and tablets arrival, evidence is emerging that the bent-forward posture often used while texting is very difficult on the neck (‘Text neck’), mid and lower back, shoulder, cellphone elbow, wrist and thumb pain. Technology is creating more digital disabilities. 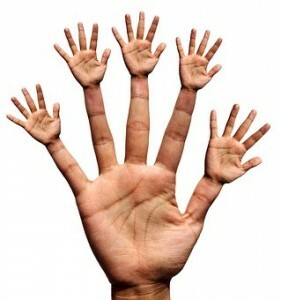 Here is a list of common problems I see every week in the clinic and have to treat with a combination of the active release technique, chiropractic adjustments to the bones (even the shoulder, elbow, wrist and thumb! Many patients think I just treat necks and backs). 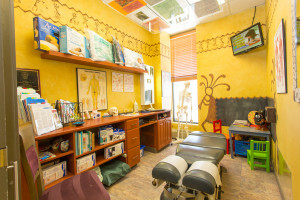 50% off Chiropractic New Patient Exams! 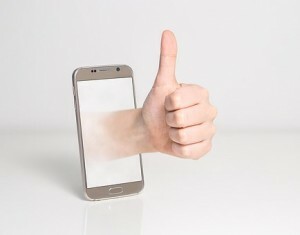 Thumb issues: many people hold their electronic devices in their hands with their palm of the hand behind the device and wrap their thumb around to the front to make use of the device. When you do this it will cause the thumb to extend out too much and cause many issues with the thumb. You should instead hold the device the way we show in these pictures. This is another examples of electronic injuries! Frequent texters might notice a painful snapping when bending the thumb. Other overuse symptoms include tenderness, pain, tingling and loss of sensation or strength. If your thumb starts to bother you have it looked at and change the way you hold your electronics! What out for electronic injuries, they can be avoided if you are more careful! Elbow problems: when using the electronics many patients hold their devices and do not rest their elbows properly. 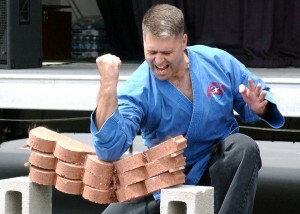 When you hold your device and have your elbows bent this places INCREDIBLE tension on the elbows and forearms. 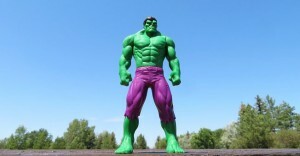 This will cause you to be constantly contracting the muscles, tendons, ligaments and nerves. As well it places tremendous strain on the elbow joints and bones of the forearm. Rounded shoulders: There is an EPIDEMIC as the number of rounded shoulders I see now and have to work on has increased dramatically. When the shoulders round forward due to looking down at your devices this changes the alignment of your neck, shoulders, upper back and lower back. The muscles in the fronts of the shoulders tighten, shorten and develop adhesions, and shoulder joints become compressed together. My mom when I was younger would always say to me, ‘Straighten up’. Try to do this when using your devices. If your shoulders are rounded it is difficult to sometimes hold the neutral alignment due to the imbalances; have them worked on to avoid future issues. Due to the shoulders rounding the neck straightens out and then over time this leads to osteoarthritis ‘wear and tear’ in the neck. I am seeing this more and more in people younger than 40! It is not all due to ageing but rather what we do with our bodies as we age. Neck problems: from looking down look at the force placed on your body! Yes another one of the many electronic injuries faced with at our clinic every day! 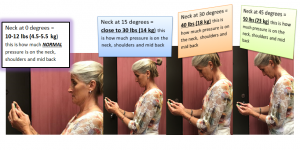 “Text neck” has become a catchphrase describing neck pain and damage from looking down at your cell phone, tablet, or other wireless devices too frequently and for too long. A head bent 45 degrees forward – a typical tilt while one is texting – exerts a force on the spine of nearly 23 kilograms, noted a 2014 study in Surgical Technology International – weight that hangs off neck ligaments, muscles and bones. A head bent 45 degrees forward – a typical tilt while one is texting – exerts a force on the spine of nearly 23 kilograms or 50 pounds! When your head and neck are in neutral alignment the head weights between 10-12 pounds. If you bend your head forward 15 degrees this more than doubles the force on the spine to over 27-32 pounds, 30 degrees: 30-38 pounds, 45 degrees: 50-57 pounds, 60 degrees a whopping 60-75 pounds! Yet a bent-neck posture, which is seen in many classrooms, is “implicated in neck pain,” according to a 2015 study in Ergonomics, which found that the mechanical demand on neck muscles is three to five times greater with such flexion than a neutral posture for seated tablet users. Tablet stands, external keyboards, voice dictation, neck support and styluses could help prevent discomfort. You should look into having your device in an ergonomic position! Lower back problems from leaning forward: This places greater pressure on discs in the lower back, joints become restricted and muscles become imbalanced. If you just bend forward by 20 degrees this places 100% more tension on the lower back discs, muscles and joints! More on electronic injuries! 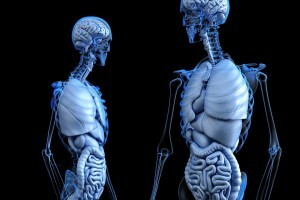 Check out this article about the inter-relationships of posture, stance, digestion, balance and much more! Dr.Pettibon is a leader in this field. There is also an excerpt below…. Rene Cailliet, MD, a specialist in physical medicine and rehabilitation at the University of Southern California. He found the following “Incorrect forward head posture leads to improper spinal function. Both the neck and lower spine have normal and necessary forward and backward curvatures relative to the skull, normal curve in the thoracic spine and rib cage. Proper cervical lumbar curves are necessary for normal muscle function. However, with a forward extended head, thee normal curves are lost both in the cervical and lumbar spine. Lung capacity is depleted by as much as 30 percent. This shortness of breath can then lead to cardiovascular disease. The entire gastrointestinal system is affected, particularly the large intestine. Loss of good bowel peristaltic function and evacuation are common causes of forward head posture. The gut is the largest endocrine organ in the body and 70 percent of the immune system is in the gut. Did you ever think about what happens to these areas due to electronic injuries? Muscles involved in posture: The body has approximately 440 pairs of muscles, with 75 pairs of those being responsible for posture. Imagine what happens to these when you round forward?